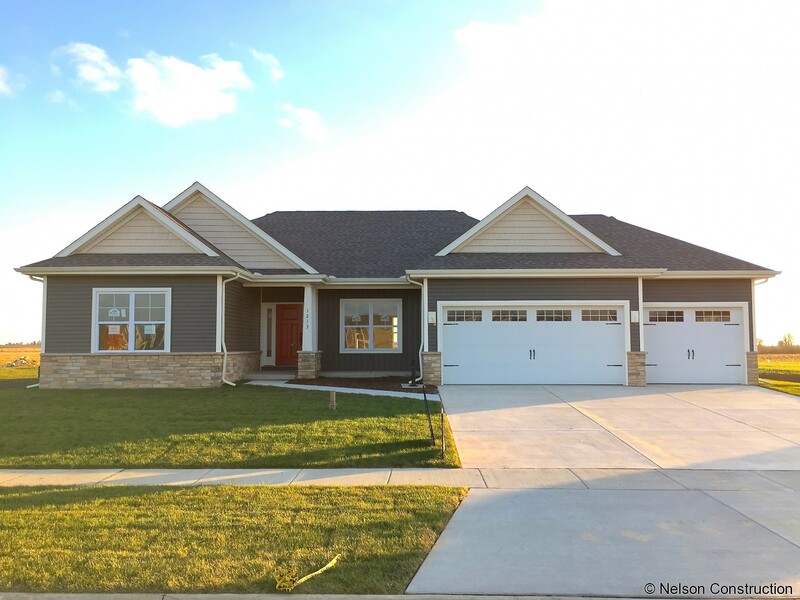 The exterior of a new Willow plan home by Nelson Builders. 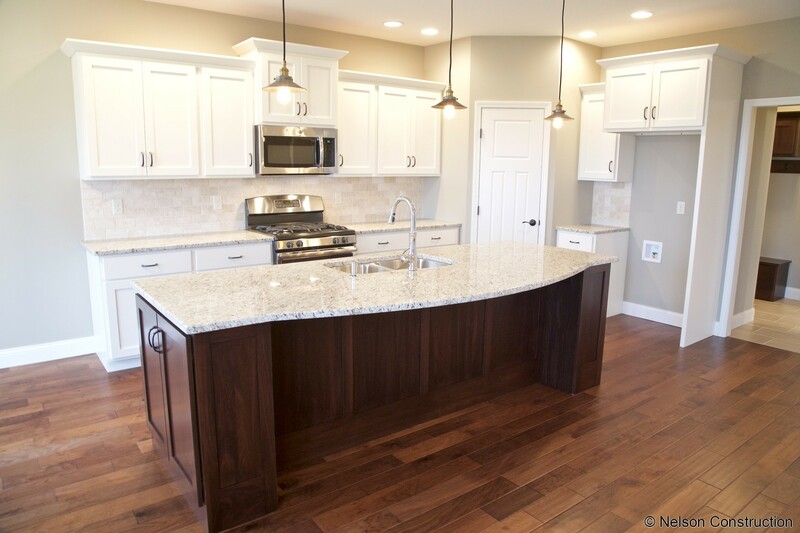 The stained raised panel island is a nice accent to the surrounding painted cabinets with travertine backsplash. 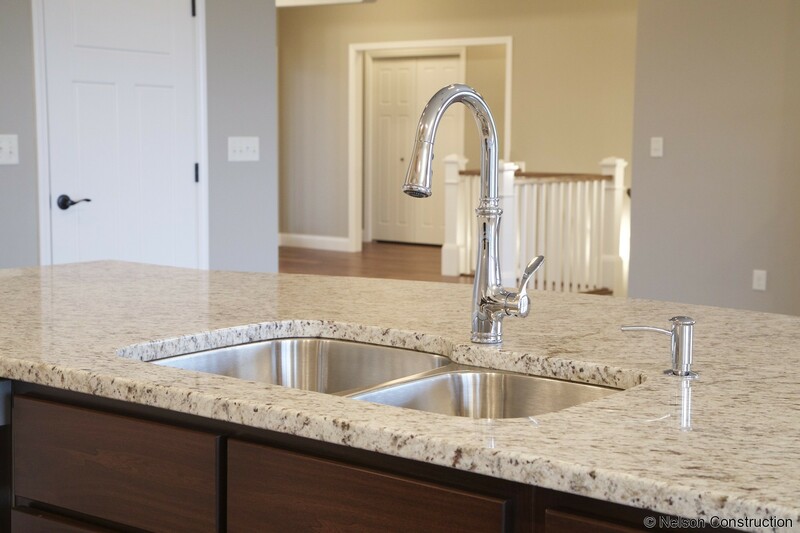 The chrome fixtures of the kitchen are an elegant addition to the overall look of the room. The kitchen and dinette overlook the open plan of the family room in this home. 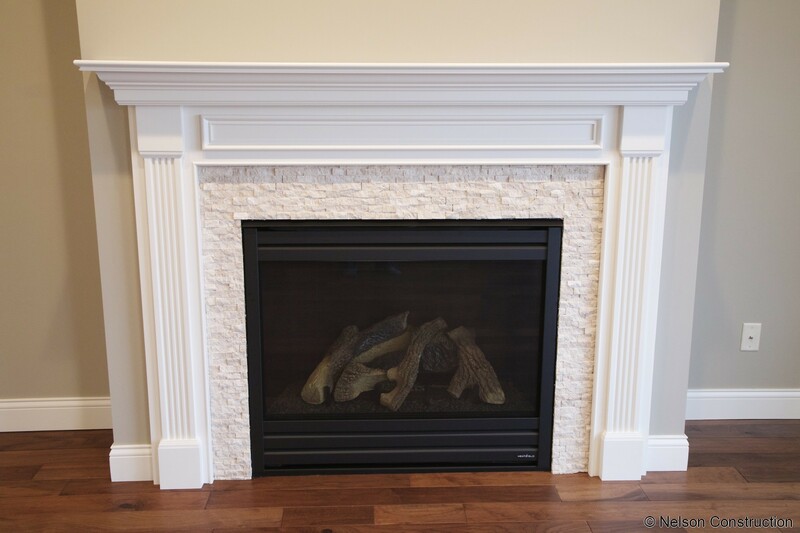 The fireplace features a split face travertine surround with a painted wood mantle. 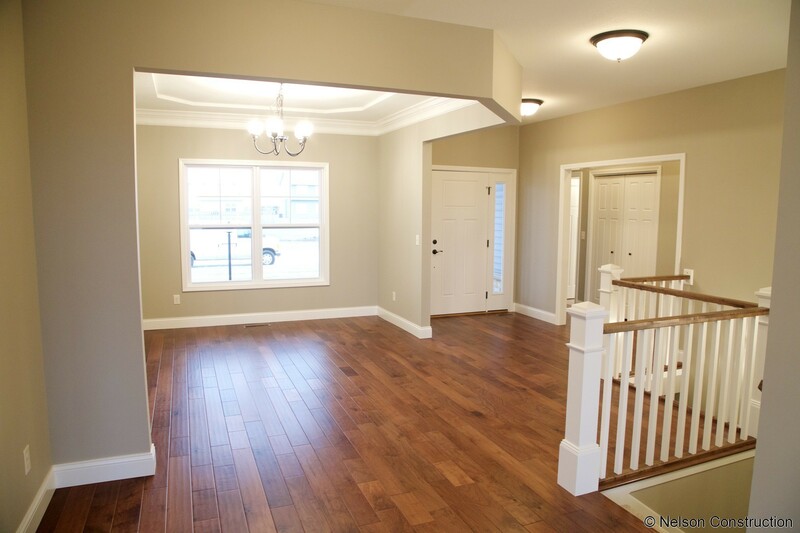 The foyer of the Willow opens to the dining room, staircase and great room giving the home a very open feeling. 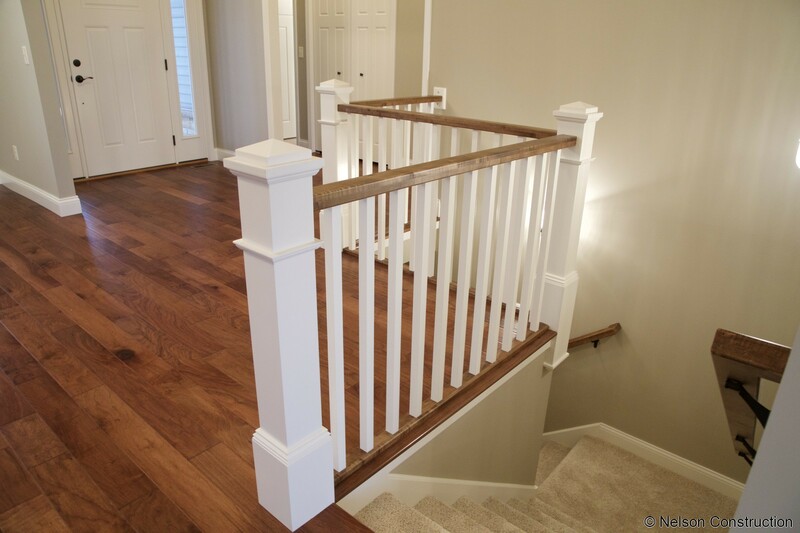 The open staircase of the Willow is a wonderful accent to the foyer and open living area. 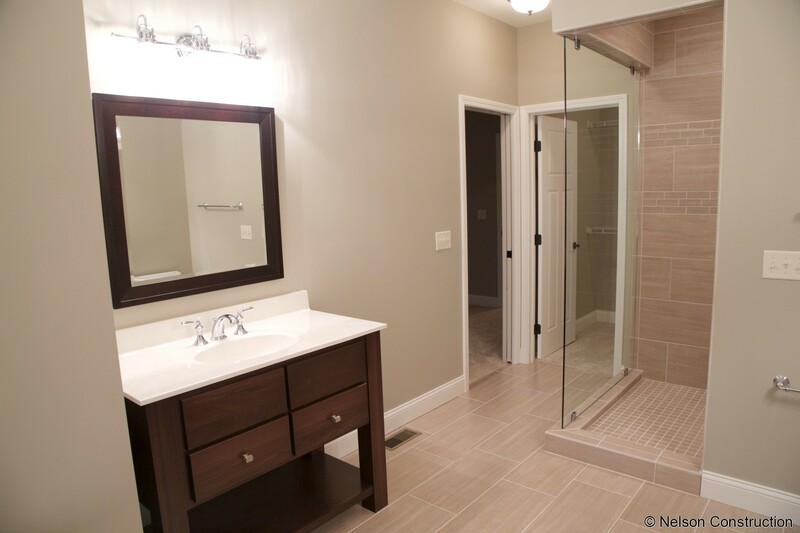 The master bathroom is one of the focal points of this home with its spa-like design and beautiful finishes. 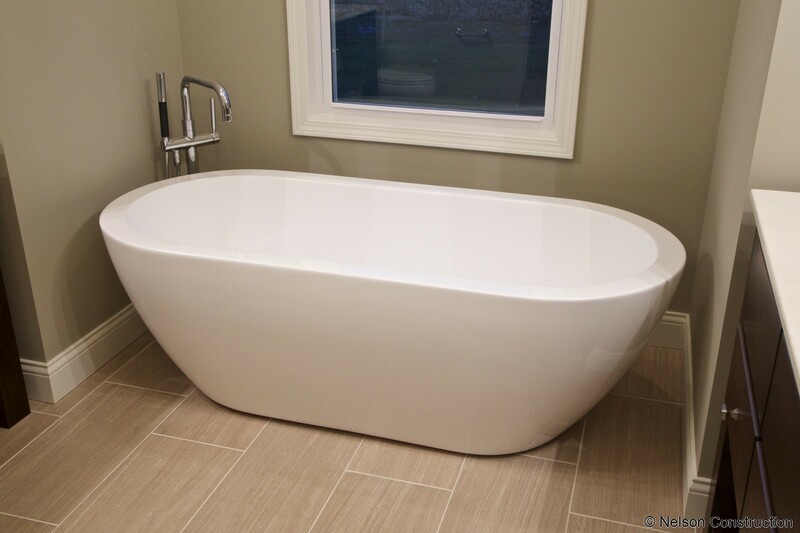 The master bathroom features an elegant freestanding tub with a floor mounted tub filler. 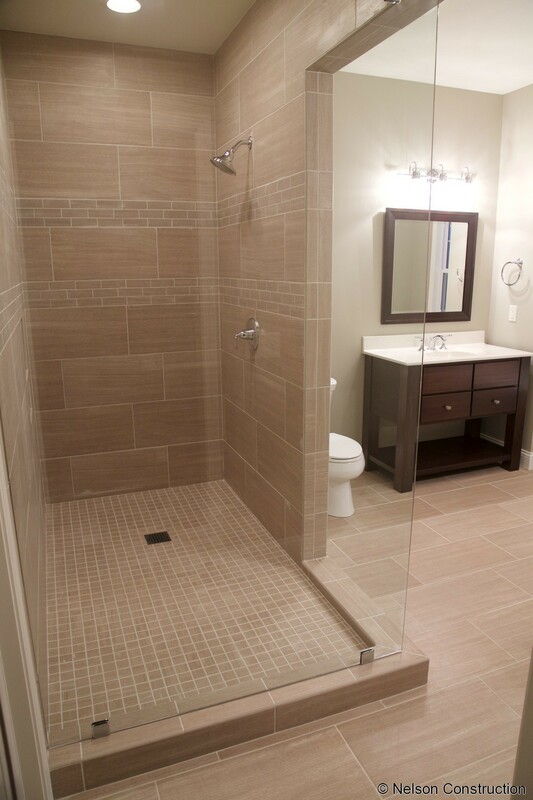 The ceramic tile shower in the master bath feels like open and elegant with its floor to ceiling glass wall. 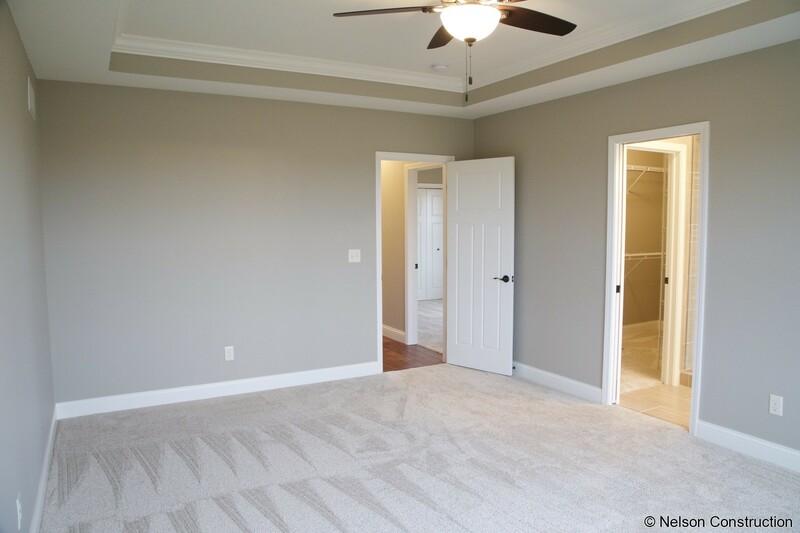 The master bedroom features a tray ceiling with crown moulding along with plenty of natural light. 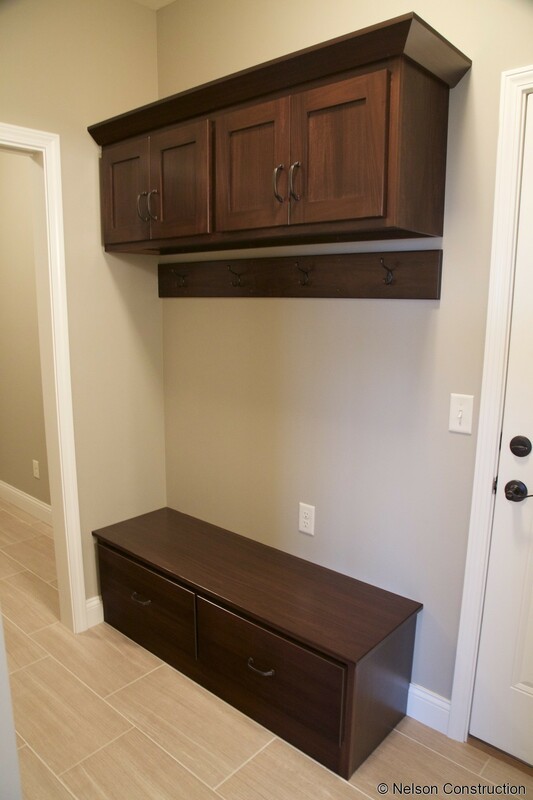 The drop zone between the garage and kitchen is lined with cubbies and hooks- perfect for shoes and coats! The welcoming front porch, with its craftsman detailed columns, invites you into this open and airy home. The kitchen, dinette, great room, dining room, and foyer are all open to create an uninterrupted view through the home. 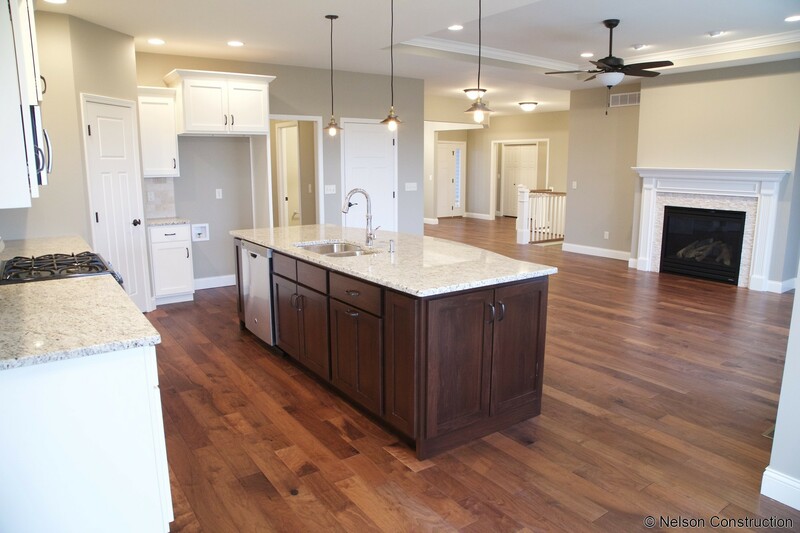 The center of the home is the gourmet kitchen which includes a walk-in pantry. 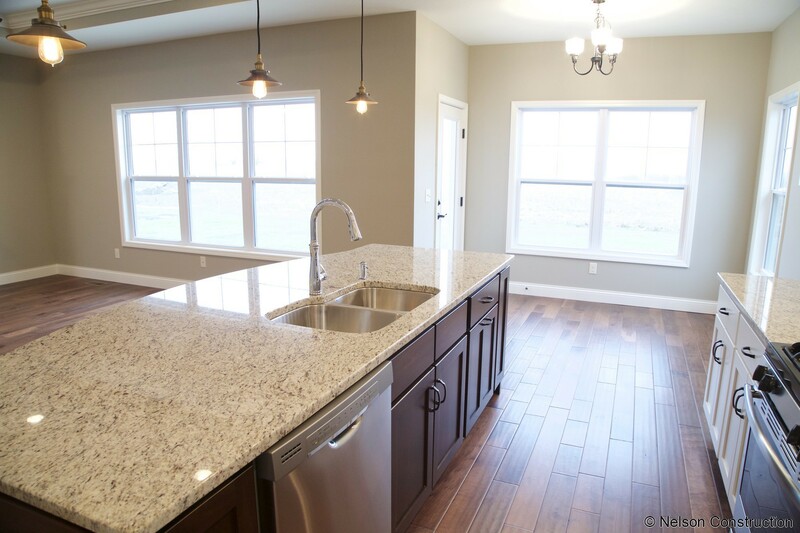 The kitchen is highlighted by the large central island with its’ sweeping granite countertop. 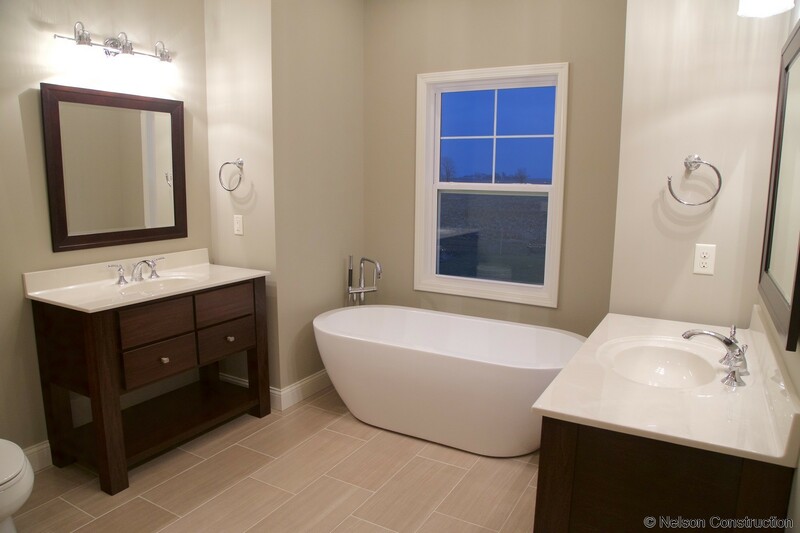 The sumptuous master suite features a tray ceiling, large closet, and master bath with a freestanding tub, walk-in ceramic shower, and separate his and her vanities. The home is complete with a full unfinished basement and a three car garage.